University of Maine's 20th President Susan J. Hunter gives a speech after being installed as the president at the Collins Center for the Arts in Orono, March 26, 2015. BANGOR, Maine — The president of the state’s flagship university in Orono will stay on for another two years, the University of Maine System announced Thursday. System Chancellor James Page said he extended President Susan Hunter’s appointment through the end of June 2018. 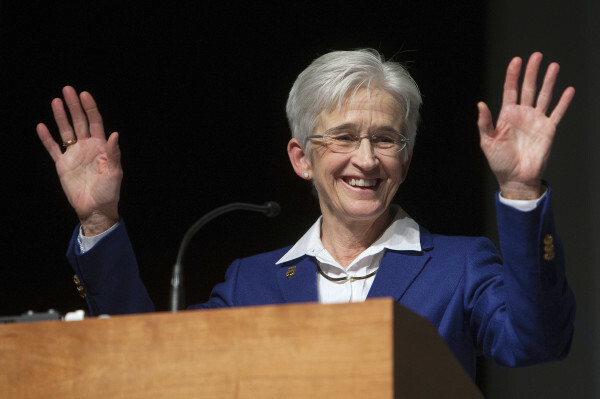 Hunter became the university’s 20th president in June 2014 and is the first woman to lead the institution in its 150-year history. At the time, she was expected to serve a two-year term. UMS spokesman Dan Demeritt said the system’s Board of Trustees received letters supporting Hunter’s reappointment from UMaine Student Government and Graduate Student Government. Under Hunter’s leadership, UMaine has seen a growth in enrollment, despite a continued decline in the number of high school graduates to draw from in Maine. The university expects its largest first-year class in history next fall, about 2,300 students — approximately 36 percent of those coming from states under UMaine’s Flagship Match program. Before her appointment as president, Hunter worked a short stint as the system’s vice chancellor of academic affairs. When former President Paul Ferguson announced plans to depart for a university in Indiana, she replaced him. On May 26 last year, Hunter agreed to stay on until June 2017. Her salary will remain at $250,000 per year. Hunter has a long history at the university. She began working at the Orono campus as a research associate in 1982 and became a full professor in the department of zoology in 1991. She has since worked as chair of the department of biological sciences, dean of undergraduate admission and most recently as executive vice president of academic affairs and provost.